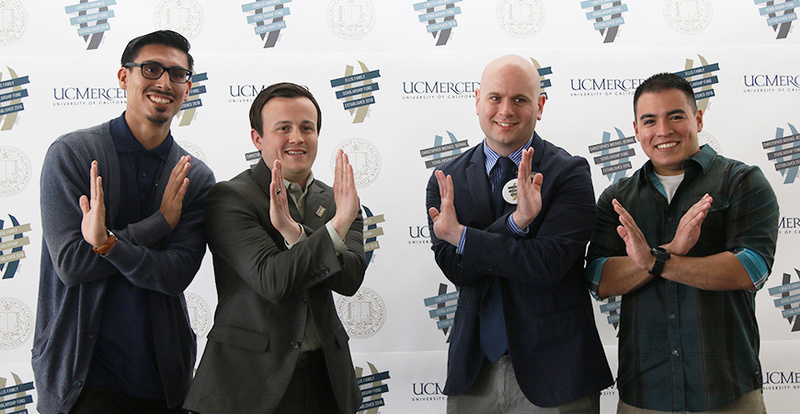 UC Merced alumnus Daniel Lobato (far right) is one of many young alumni who have given back to their alma mater. UC Merced alumnus Daniel Lobato (’13) always planned to give back to the campus that provided him an education. As a student, Lobato started with modest donations during the university’s annual Giving Tuesday fundraiser, which returns Nov. 28 as Give Tue UC Merced. Today, he’s a pilot and first lieutenant in the U.S. Air Force, and is the benefactor behind the Lobato Endowed Scholarship Fund, which will support veterans, children of veterans/active duty service members and/or first-generation students with strong academic performances. The endowment is a way to honor his family and inspire current and future Bobcats. He believes students can become whoever they want to be at UC Merced. “That was more than true for me. I was a cognitive science major, but found myself serving as president of an engineering club by my senior year. Two years later, I was an Air Force pilot,” Lobato said in an email interview from Turkey, where he is deployed through this year. Alumni giving is an important aspect of the university’s development, in part because it shows that graduates have confidence in the value of a UC Merced education. Last year, more than 1,000 graduates donated to the university, helping it rank 63rd nationally in alumni giving rate among public institutions, according to the U.S. News and World Report “Best Colleges” analysis. The campus is approaching 8,000 total alumni. Graduates such as Lobato serve as role models and help set the tone for students and alumni, said Chris Abrescy, executive director of alumni relations. The university has a high percentage of first-generation and low-income students; many rely upon private and public support to complete their education. The pledge by Lobato also sets another example for alumni. Lobato, who grew up mainly in San Diego, was originally inspired by reading about the first endowed scholarships created on campus. He started with small donations to UC Merced as a student, but believed he could do more after finishing his degree. Around the time of his graduation, Lobato began a job search that ultimately led him to the Air Force. “As long as I can remember, I’ve always had it in my head that I wanted to serve in the military in some capacity,” he said. Lobato, whose pilot call-sign is “Zero,” started his search with the Air Force because others recommended that branch of service. Following that path also helped him achieve another goal.